I broke my hip skiing in January 2010, split up with my girlfriend, and was between contracts, but working on my own idea again. My recuperation required lots of walking, and losing weight, so the obvious thing to do was buy a netbook, install Unbuntu and go to India. I chose an Asus eeePC 1101HA; the model I bought on Ebay has: Atom dual core 1.33GHz, 2G Ram, 250G hardrive, GMA500 graphics chip, and a 1366 x 768 resolution 11.6" display. On battery, its supposed to go up to 11 hours, easily manages 6, weighs less than 1kg. And feels robust. I now have a tri boot Win7/Ubuntu 9.10/Lucid 10.04 which can drive the internal screen, with an external monitor both at full resolution, and a sensible partition map. Look left. 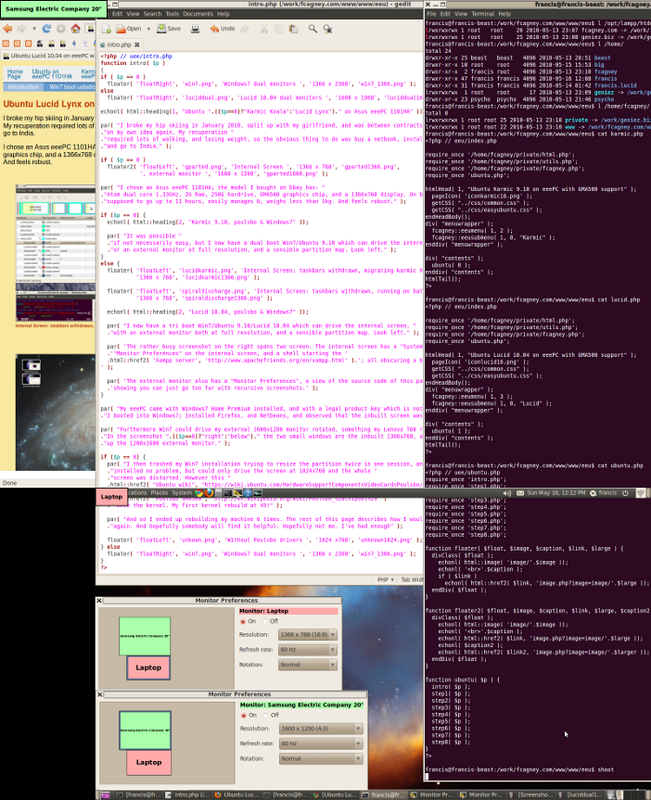 The rather busy screenshot on the right spans two monitors. 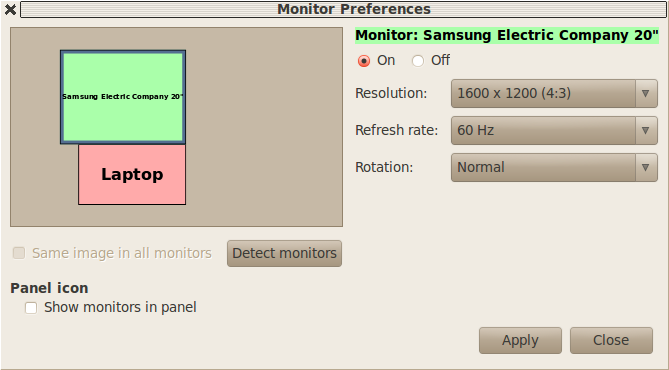 The internal monitor has two "Monitor Preferences" one with the internal screen highlighted, the other the external. The rest of the screen show the source code of this page and Xampp server symbolic links; all obscuring a browser rendering this page. 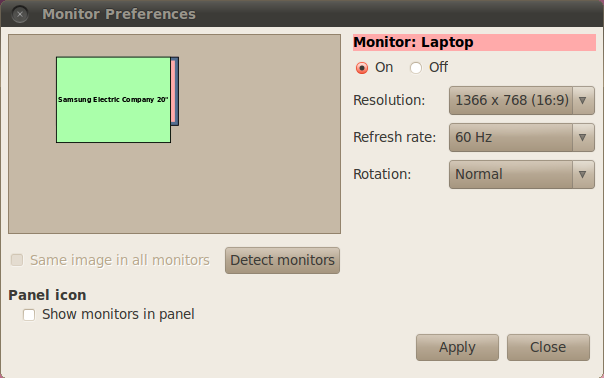 Furthermore Win7 could drive my external 1600x1200 monitor rotated, something my Lenovo T60 running Ubuntu could not. In the screenshot below the two small windows are the inbuilt 1366x768, and the big window takes up the 1200x1600 external monitor. If you have a Windows boot, or Virtual Box that can directly access a USB stick, then you can use the Windows 7 USB/DVD Download Tool to create a boot USB stick. My WinXP in a virtual box had stopped talking to USB devices, and I'd trashed my Win7 so I had to make a boot Win7 usbstick the fun way. In the top right corner of the "GParted" window there's a pull down prompt to select the device. Make sure you select your USB stick "/dev/sdb", or "/dev/sdc". "/dev/sda" is your hard drive and you don't want to do what comes next to your hard drive. From the "Device menu" take "Create Partition Table". After answering yes, the whole stick will be unallocated. Click on the big grey blob of unused space to select it, then "Partition"->"New". Change the "File System" to "ntfs", then click "Add". Then "Edit"->"Apply All Operations" This will take a while. When its finished: "Parititon"->"Manage Flags" and click on the "Boot" checkbox and then "Close". Exit "gparted"
Copy all the files from the Win7 iso onto the USB stick. Unfortunately I don't know of any Unix tool that can read the Win7 iso. 7Zip can but runs only under Windows, and did work in my virtual box. The netbook will now boot from the USB drive, and Windows install will take you through the procedure. You'll be asked at some state to partition the hard drive. I just let Windows have the entire drive. There were 1 or 2 semi failed Unix experiments, and the recovery partition, and to be honest I was scared of the Windows partitioner, and knew that the Ubuntu install partitioner was good at resizing Windows partitions. Also Windows7 needs 2 parititions, one about 100M to do with booting, and then Win7 itself. When I resized I gave my Win7 partition 30G. The delivered Win7 needs about 20G, but the clean Win7 with 6 browsers and NetBeans installed takes about 13G. So I would make the Win7 partition between 20 and 25G, if doing it again. There are instructions on the Ubuntu website for creating a bootable USB stick under Windows, Unix, Mac etc. I used usb-creator and I observed that the installer remembers information you've entered. If mysterious things seem to be going wrong, recreate the boot USB stick to get a clean start. On Mon 10 May 2010 I installed Win7, and Karmic 9.10 on my eeePC. Below describes how I created the partitions then. Happy with my Karmic, I started writing the "Karmic on eeePC 1101" page. On Wed 12 May the poulsbo drivers became available for Lucid 10.04, which had been out since 1 May 2010.
sudo cp -R /home/big/francis . You can see the reverse being done, Lucid changing the mount point from /home to /home/big and copying /home/big/francis to /home/francis. Note this is not a good way of migrating, see Step 9 migrating. However if it didn't work properly I had nothing tolose because only a copy of /home/francis would be corrupted. What is important however is that whenever I copied to or from /home/francis the operating system using this directory was not running. 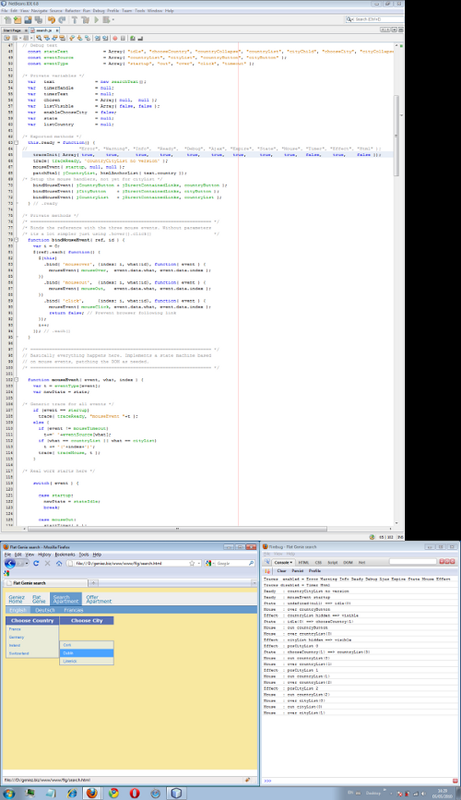 As Win7 could drive dual monitors I wanted to be able to do Java Script work under Win7. The ntfs partition, mounted as /work is attached as the D drive under Win7. Another advantage of having /home on a seperate partition, is that all your user data and settings will be preserved over repeated installs with the same username. However this can be a big disadvantage if you mess up your display settings. See "Step 8 External monitor". When you click forward, ignore the message that the ext3 partition, in my case /dev/sda6, is not used. This is exactly how you want it. When operating system install withdrawl gets too bad, you can install something on this partition well isolated from this your live install. Click on Start, then "Control Panel". Click on "System and Security", and then in the bottom right "Create and format hard disk partitions". This will start the "Disk Management" right. Most of the partitions are unlabelled. (C:) will be an NTFS "File System". There'll be the 100MB NTFS boot partition, and one more NTFS partition about the size you created in the previous step. Right click on its icon and take: "Change Drive Letter and Paths...". Click "Add". Make sure the "Assign the following driver letter" is ticked and the drive is D. Click "ok". Boot into your Ubuntu installation. Check that the file you created on D: under Win7 can now be seen in /work. On Thursday 13 May 2010 installing the updates upgraded the kernal from 2.6.32-21-generic to 2.6.32-22-generic. I'm pretty sure this kernel upgrade is essential to getting the poulsbo drivers to work, and am speculating it was made by the poulsbo maintainer(s) to enable poulsbo to compile into Lucid. I first tried this install on Wed 12 May, and I was unable to update, the package respository seemed temporarily corrupted. The script reported a fail at most steps. On rebooting I got a flashing login prompt, which restoring xorg.conf from a recovery console didn’t fix. "System"->Administration"->"Update Manager". Ignore the message that "Your system is up-to-date", and click on "Check". Click "Install Update", and you'll get the latest kernel, and lots of vital security(bug) fixes. This will take a while, and then you'll have to restart. You'll notice the grub menu has changed, you now have a choice of two kernels, the latest the chosen one, and both kernels also have a "(recovery mode)". This is one of the few times you'll see both CPUs working 100% for a long time. Compiling source code is one of the few operations where the CPU, not memory, or disks is the bottleneck. 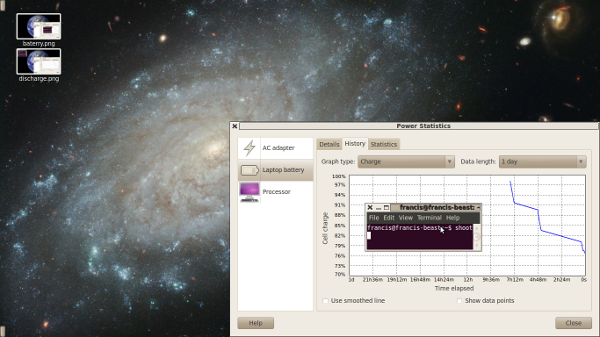 The screen shot below was taken after rebooting with the rebuilt kernel, and with my 1600 x 1200 monitor attached. 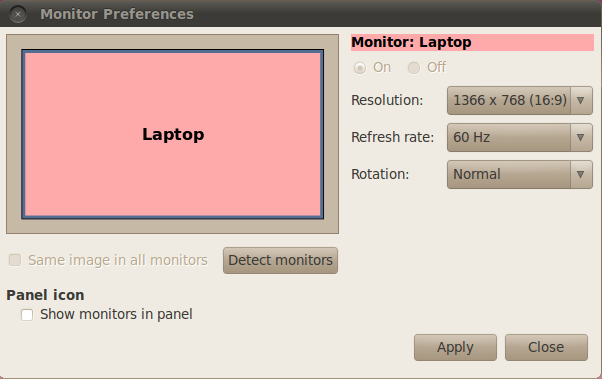 The external monitor is set to 1280 x 960 resolution, and the internal screen overlaps the external monitor. 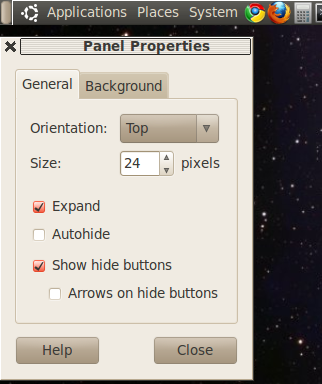 The "Display Preferences" window is partly covering a screen shot taken while compiling in the poulsbo drivers. Your 1366 x 768, or 1024 x 600 screen doesn't have many lines. Display Preferences: Samsung 20" at 1280x966 obscuring Laptop 11"
Display Preferences: Laptop 11", Samsung 20"
If you restart with an external 1600 x 1200 monitor attached and take "System->Monitors", you'll see what's on the left. If you click on the Monitor picture, the two will spring apart. Any attempt to let this page change your "virtual resolution" in "your configuration file" (/etc/X11/xorg.conf), will probably end in no good. Or you can download my xorg.conf file. thank you, this is helpfull! will this work for ubuntu 11.10 too? Please tell me that youre going to keep this up! Its so excellent and so itaormpnt. I cant wait to read more from you. I just really feel like you know so much and know how to make people listen to what you might have to say. This weblog is just also cool to be missed. Excellent things, genuinely. Please, PLEASE keep it up!